What will Grandma look like when she’s dead? I recall little about the flight to England. I must have watched movies, slept, eaten, drank but I have no recollection. What I do remember is watching it unfold around me, feeling part of it yet removed. I wondered about the stories of my fellow passengers. Tears would bubble up as I remembered what we’d being doing once we disembarked in London. Part of me wanted to randomly tell people that we were here because my Mum had been given but weeks to live, as if by telling them it would somehow normalise it. That by introducing them into my shocked state would help me make sense of it. 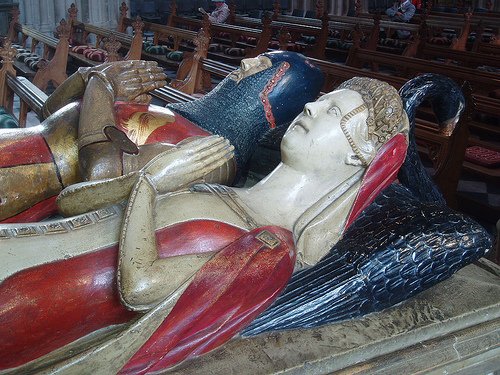 In Worcester Cathedral, this is believed to be the tomb of Sir John Beauchamp and his wife Joan. Originally I’d planned to drop Tony and the kids at my Dad’s home and make the trip to see Mum alone. I wanted to see how she was (translation: how did she look) so I could prepare the children. It was a story and SMS from my cousin, Heather, that changed my mind. A friend of hers had made a similar trip many years before. But instead of going direct to see her Mum in hospital, she went to the family home to settle her young children and have a rest. During that time, her Mum passed away and she didn’t get to see her alive. My cousin said it took years for her friend to forgive herself. “I’d just hate for you to have to experience that, especially after all you’ve gone through to get the kids’ passports and get there quickly,” she told me. Her SMS to me when we landed in the UK was another, specific request to do so. Based on when my Mum died, I could have taken the detour. Yet I’m incredibly glad we didn’t. ‘Preparing’ the children was simply my excuse to try and delay the inevitable. I will write another post about children, funerals and death, given grandparents are typically their earliest exposure to the end of a human life. How our two dealt with it was with a matter-of-fact calm that was inspiring – and gave me much needed lighter moments. Like the time we told Miss G (then 5) we had to go to England because Grandma was dying. “Will she look like this?” she asked, dropping her head to a left angle, rolling her eyes back, opening her mouth and letting her tongue hang-out whilst making an odd choking sound. Umm, hopefully not, darling.